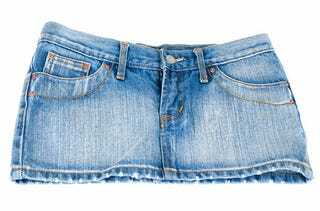 We love that The Guardian calls the town of Castellammare di Stabia's miniskirt ban "a small, incompetent step backwards." And he's not even talking about the Italian mayor's ban on blasphemy, sunbathing, or public soccer! Luigi Bobbio, mayor of the seaside town, is a man on a mission: a mission to restore morality. A ban on miniskirts, cleavage and anything "too revealing" will, he declares, "restore urban decorum and facilitate better civil co-existence." The soccer ban, presumably, falls under the center-right mayor's opposition to all things "rowdy, unruly or simply badly behaved." We don't know about that, but it's certainly drawn plenty of ridicule and outrage. Female politicians protested during the vote — albeit without courting the fine, which runs between 25 and 500 euros. At least one person's in support: the local priest. Says he, "I think it's the right decision...it's also a way of combating the rise in sexual harassment." That's right, get those corrupting jezebels off the streets for their own good! Soberingly, the ridiculous laws are not in a vacuum; says the BBC, "Castellammare di Stabia is latest city to make use of the extra powers handed down by Prime Minister Silvio Berlusconi's government to mayors, in the effort to fight crime and confront anti social behaviour. In other places they have banned sandcastles, kissing in cars, feeding stray cats, wooden clogs and the use of lawn mowers at weekends." Making a sandcastle in wooden clogs and a miniskirt is, presumably, grounds for incarceration. Thin edge of an alarming wedge or random crackpot? That's the question. That, and whether they're abiding by the fingertip rule.